I’ve been re-reading Butler’s work lately because I’m thinking about political mimesis, and I was struck along the way by her very frank and admirable comments about the fact that if you write a bunch of things over time, you don’t necessarily want to go back over them to make sure that your view is the same everywhere. At NYU. This is a picture of an art gallery from the street. The street reflected in the background. Some random art in the bottom. 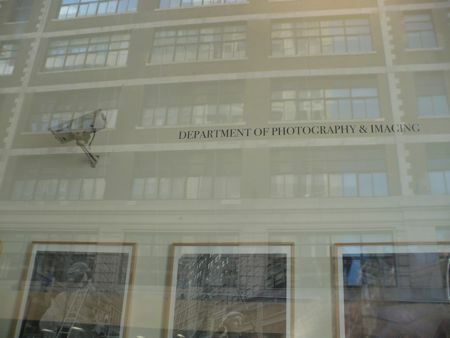 But really I was just tremendously entertained that the DEPARTMENT OF PHOTOGRAPHY & IMAGING stuck its name right next to a surveillance camera. I guess they are afraid someone might steal their images? Or at least they want to have images of people stealing their images? Or perhaps the security camera is actually part of the exhibit? The white of the camera body blends so nicely with with the white of the wall. It reminds me of a little robot that has stuck its iron fist through the sheetrock and is waving for attention.